An article in yesterday’s NY Times about Arena Stage’s new “Cradle” for new play development and a tour I had this morning of the newly renovated Chandler Center for the Arts are reminders that sometimes infrastructure for the arts is literally infrastructure – bricks and mortar supporting the creative work of artists and community members. These two facilities and their missions could not be more different, but both are needed for a sustainable future for the performing arts. Arena artistic director Molly Smith explains, “…we’re trying, in a big way with a new building and with money, to see that new plays have a home here.” That money comes from a strong subscriber base and significant private donations from individuals. The mission of the Cradle, “developing new American plays and cradling artistic risk,” is called “an act of some theatrical audacity.” Arena is not the first theatre to try to build an artistic home for playwrights, but given its location in the nation’s capitol, has symbolic significance. Ultimately, support for playwrights is needed if new plays are to be written, and new plays (preferably good new plays) need to be written for the future health of the art. Arizona has gotten a lot of bad publicity recently, but it’s not all bad news here. 2100 miles from Washington D.C., the City of Chandler and the Chandler School District are doing their part to create a sustainable infrastructure for the arts. 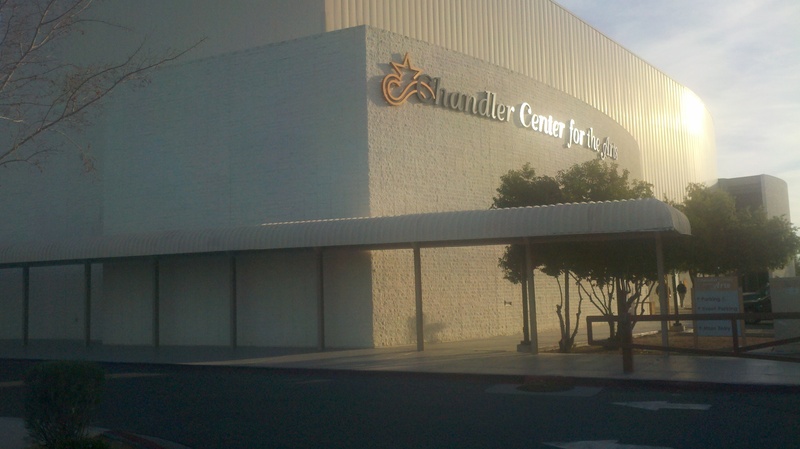 Built in 1989, the Chandler Center for the Arts is a partnership between the city and the school district. The facility is not only the Phoenix suburb’s cultural hub, presenting everything from Golda’s Balcony and Dancing on Ice to community orchestra concerts and jazz, the center also serves as the performing arts venue for the local high school. City and school district bonds funded the $6 million upgrade to the rigging, seating, lighting, and ADA compliance. This is not a theatre where the most innovative new play will be developed and written. However, it is a place where the most innovative new playwright may get to have his or her first experience as an audience member or a performer (the high school’s spring production is Grease). Its bricks and mortar — paid for with public money – are as important to the future health of the performing arts as Arena’s Cradle. This entry was posted in Arts education, Arts funding, arts infrastructure, Arts policy, Uncategorized and tagged Arts education, Arts funding, arts policy, cultural policy, performing arts, Theatre. Bookmark the permalink. That’s just K-12. State College funding is even tighter. Here’s a link to the “Help Save the Given Institute” Facebook Group. The original architect for both stages (Fichandler and Kreeger) at the Arena was Harry Weese- whose Given Institute in Aspen is an echo of those stages morphed into a Medical Lecture Hall. …one of the nicest uses of space for the relation between speaker and audience I’ve ever seen….. the man understood scale- human scale. The relationship of the building to the grounds is simply perfection. The Given is now threatened with demolition because the University of Colorado Medical School desperately needs the money from the sale of this parcel of Aspen real estate. Several universities have or are considering selling cultural assets to make their budget ends meet. It’s a short term solution with long-term consequences.